This weekend sees promotions across the country celebrating anniversaries, holding new tournaments as well as the return of established ones. Add in the usual dash of rivalries and new encounters and we have another packed set of three days. Let's get Ready For The Weekend! On Friday night, Fierce Females are back at Walkabout in Glasgow. This show will mark Fierce Females' third anniversary and it's looking to be one of their best events ever. At the last event which featured a championship rumble, there were a number of talking points. One was Leah Owens eliminating her own sister, Kasey Owens during the rumble. There is evidently some tension between the twins and the most obvious way to get rid of that is to let them go at each other on October 30th. It won't be the first time they've faced each other but it may be their first encounter were competition isn't the only thing that is driving them. From the bad blood between twins to the bad blood between baes. Sammii Jayne & Debbie Sharpe have been beside each other for months in Fierce Females. They have been inseparable. That was until 'Rumble In The Jungle' when Debbie eliminated Sammii from the rumble match. Understandably, Sammii Jayne is not best pleased with her bae, Debbie Sharpe. Debbie claims that Sammii would have done the same to her if the tables were turned but Sammii Jayne disputes that. While Sammii Jayne claims to have forgiven Debbie Sharpe for her actions, we'll find out if that is true this Friday when they meet in singles action. In Fierce Females there are twins, there are baes but nothing compared to the friendship between Bete Noire and Viper. That was until 'Rumble In The Jungle'. After Viper won the rumble match and become only the second Fierce Females Champion in it's history, Bete Noire came to the ring to celebrate with her long time friend. And that is when it changed. Without warning, Bete Noire laid out the new champion with the championship she had just won. Since then, Bete Noire has said little on the subject, Viper has said even less. That was until a few weeks ago when Bete Noire finally spoke. She told Viper that she was sick of living in her shadow and that this was the new Bete Noire, the real Bete Noire. Fierce Females have now announced that Viper will defend the Fierce Females Championship against Bete Noire in Glasgow in a Last Woman Standing match. Both of these women competed in the very first Fierce Females event. Now on October 30th, they will fight for the biggest prize in the promotion. But this is more than just about a championship. Viper has now reached the top in Fierce Females and will give her everything to stay there. However, the Bete Noire that now stands across from her, no longer cares how far she has to go. She refuses to be in anyone's shadow any more. These former friends meet this Friday and only can be left standing. 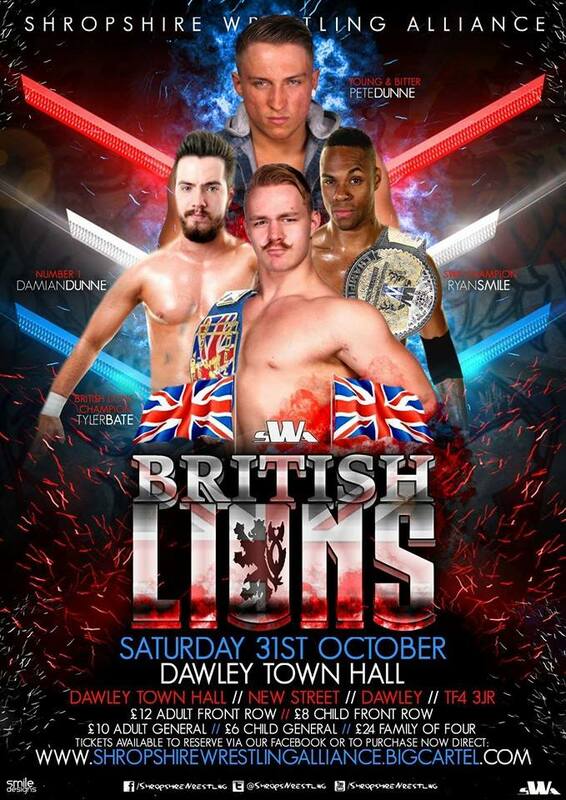 Moving on to Saturday and Shropshire Wrestling Alliance are back at the Dawley Town Hall with their British Lions tournament. In a change to this year's tournament, the winners of the qualifying matches will go on to a five-way elimination match with the British Lions Champion, Tyler Bate on November 28th. Speaking Tyler Bate, he joins forces with the SWA Champion, Ryan Smile in the main event to face The Dunne Brothers. While this match is not for any championships, it is all about pride. The champions will be looking to take the win to showcase their own championship reigns while The Dunne Brothers will be aware that a win over the champions will give them a legitimate claim to a future championship match. In a special attraction, non-tournament match, 'The Welsh Destroyer' Nixon Newell will face NXT's 'Blue Pants' Leva Bates. Nixon is one the of the gems in the Shropshire Wrestling Alliance crown, facing almost everyone in the promotion in some form or another. Leva Bates on the other hand has being tearing it up in WWE NXT as well as across the independent scene in North America. This will be a great first encounter between these two young wrestlers. 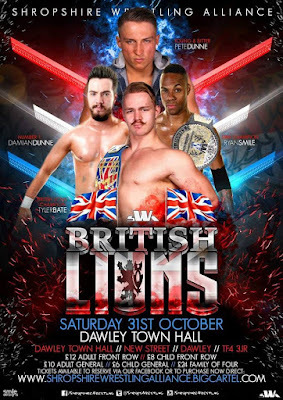 The British Lions tournament itself features it's usual plethora skilled athlete such as Mike Bird, Wild Boar, Ethan Silver and Chris Brookes to just name a few. One match that does stand out from the crowd is 'The Priority' Chris Ridgeway vs 'White Lightning' Mark Andrews. While Mark Andrews has been tearing it up in Impact Wrestling as the winner of British Boot Camp 2, Chris Ridgeway has being making a name for himself in the UK. Ridgeway has gone against some of the best the UK has to offer. This Saturday he gets to go against another and a man he has openly admitted to admiring and respecting. Mark Andrews is already known for putting on stellar performances every time he enter the ring. Ridgeway is fast becoming know for doing the same. This match will be one not to be missed on October 31st! 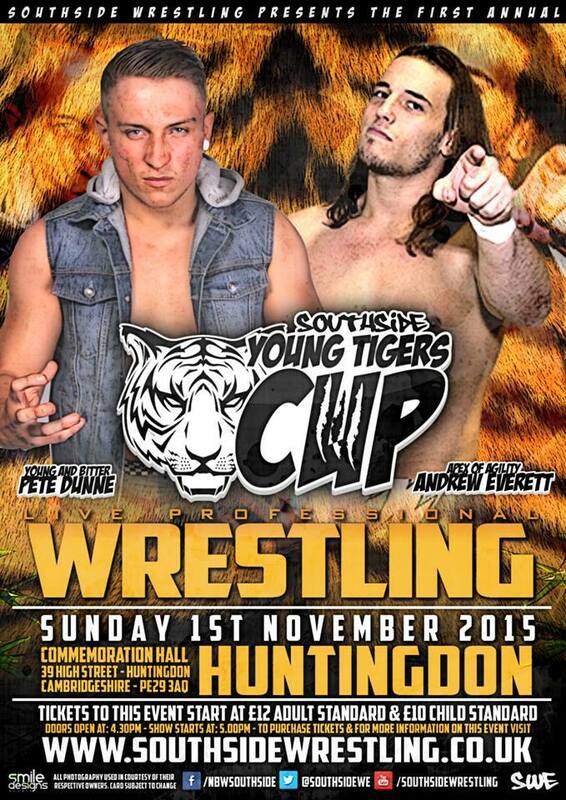 Sunday night in Huntingdon will see Southside Wrestling hold their inaugural Young Tigers Cup at the Commemoration Hall. 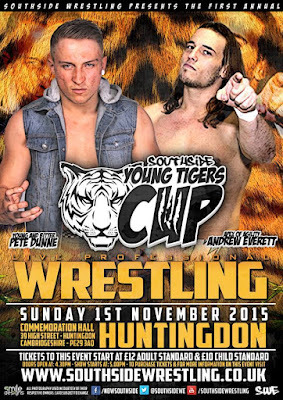 The Young Tigers Cup will see some of the UK's best young wrestlers compete in a one-night tournament to win the eponymous Cup. One of the tournament quarter-final matches will see former Speed King Champion, 'The Aerial Assassin' Will Ospreay face The Pledge of The Righteous Army. Ospreay has face some amazing talent in Southside Wrestling on previous occasions. The Pledge is a young man who is so eager to prove himself that he has rejected his own name in pursuit of the approval of The Righteous Army. Ospreay has proven himself time after time. The Pledge is a man who is quickly catching the eye of the Southside Wrestling fans. However, The Righteous Army are known for using their number their advantage. Ospreay will be looking to add another accolade to his resume but The Pledge will be looking to prove himself further to his fellow Righteous members. Another tournament quarter-final that will take place on November 1st will have an international element to it when Trevor Lee compete against 'SuperBeast' Dan Moloney. Trevor Lee is well known to fans who have seen him in PWG & TNA, holding gold while with both companies. Dan Moloney is a hungry young man whose strength is only matched by his talent. In recent months, Dan Moloney has competed against a number of well-known names and has matched them every time. Trevor Lee will be looking to add more silverware to his collection. But he'll have a very tough challenge in the form of Dan Moloney to overcome first. As for Moloney, well he'll be looking to showcase further why he is the 'SuperBeast' on Southside Wrestling. The night will not only showcase the young tigers of Southside though as the leader of 'The Righteous Army', 'The Righteous' Joseph Conners will be in action as he defends the Southside Heavyweight Championship against the number one contender, Martin Kirby. Joseph Conners has defeated many during his reign as champion, a reign he will want to continue. His opponent however is one of the most decorated men in the UK today. Martin Kirby has held both the Southside Speed King & Tag Team Championship in the past. A win on Sunday would make him a Triple Crown Champion in Southside, an accomplishment that only few hold. Kirby became the number one contender due to his incredible drive to win. Joseph Conners desire to keep the Southside Heavyweight Championship may be the only thing to equal Kirby's drive.